The SUV crowd is mostly known for racing to the store but BMW’s 2019 X5 model could make even that exciting, with a six-cylinder xDrive40i that reportedly does 0-60 in 5.3 seconds. If that’s a little too pokey for you, the V8 version can do it in 4.6 seconds. The V8 has a top speed of 155 mph. For tech lovers, the X5 has a generously sized infotainment system with two 12.3-inch high definition digital displays, a backup assistant that takes over when the vehicles goes into reverse and other active driver assistant systems. BMW Plant Spartanburg in South Carolina made final preparations to begin production of the new beast throughout the summer. The mid-size luxury SUV, when it goes into dealerships in November, will go head-to-head with the Mercedes-Benz GLE and Lexus RX. This is the fourth generation for the X5, introduced nearly 20 years ago. It has sold more than 2.2 million units worldwide in the first three iterations. 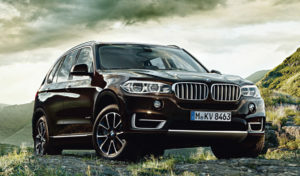 In the U.S., the X5 has ranked in the top three best-selling BMW models every year since 2001. The success has necessitated several expansions of BMW Plant Spartanburg – now the largest BMW plant in the world.